On Tuesday this week, I completed the first draft of book zero of my Chimney Rabbit series – the prequel story, Tales of the Ancient Rabbits. This is my third completed novel, but the first to be restricted to what seems to be the standard Middle Grade length – it clocks in at just a whisker under 37,000 words, which is just over half the length of The Chimney Rabbit. It’s been an interesting challenge, keeping the book to this length – my original plan had to be ruthlessly pruned, including several cities, many adventures and a revolution, but there’s still plenty of action, and I think it holds together pretty well as a story. Now comes the most important part – the second draft. Then the third. There are stories of writers who can bash out first drafts and just send them off, but I’m definitely not one of them. Some writers revise their work as they go along, constantly running back through their book, so by the time they write THE END, it’s ready to go. That’s an interesting concept, but sometimes looking back over your work is the best way to discourage you from completing it! No, I’m a “bash out the first draft, then polish it over and over” kind of writer. The first is the most important. You’ve got to give yourself time to forget what you’ve written, to see it with the freshest eyes you can bring to bear on it. Printed a copy at Lulu. You see, this is the dawn of the age of self-publishing, and even though I have no real interest in self-publishing at the moment – I’m heavily invested in going down the traditional publishing route, for at least the foreseeable future – it has provided me with some absolutely excellent tools for producing drafts I can read as if they were real books. Export the book from Scrivener as an epub. 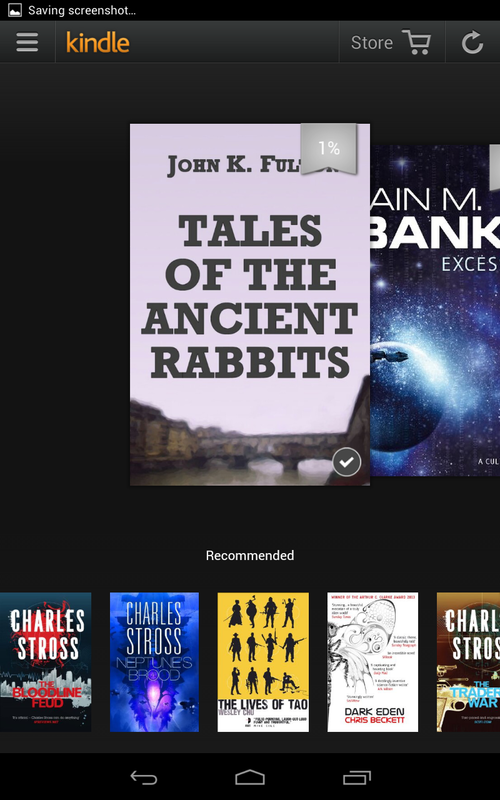 Open the epub in Sigil and tidy up the table of contents and title page. Add the epub to Calibre. 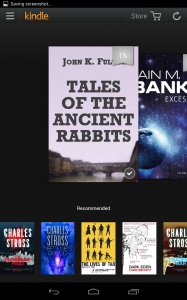 Using Calibre, convert the epub to mobi format. Copy the mobi to my Kindle, Nexus or phone. This works well, gives me a nicely-formatted ebook (albeit with an amateurish cover – I’m no artist) and lets me read the whole book in exactly the same way as I would any other ebook. My first draft ebook in the Kindle app on my Nexus 7 tablet. I used the ebook to have one quick read-through, looking for mistakes. I found about four, which is proof of what I said about having to give yourself time before reading the work – there’s no way there are only four mistakes in there. No way at all. Having done the bare minimum checking, I decided to get my printed copies. Export the book from Scrivener as a Word document. Paste the content into my trade paperback-sized document template. Do a bit of formatting in Word – this is something that Scrivener isn’t good at, but also that Scrivener doesn’t claim to be good at. It’s for generating content, not generating final output. So as this process is also something that needs to be done every time you export from Scrivener, I have written a few Word macros to help with this. Upload the Word document to Lulu. Use Lulu’s cover designer to create an awful amateurish cover. Don’t judge me. Dammit, Jim, I’m a writer, not an artist! Order a couple of copies of the paperback – one for me, one for my other half. This is surprisingly reasonable – two copies of a 202-page trade paperback, with colour cover, including postage, came to £13.15. Now I play the waiting game. Unfortunately, Lulu is pretty quick at printing, binding, packaging and sending these things, so I got the shipping notice this evening (Friday) after uploading the file late on Wednesday. I’ll have it in my hands under a week after finishing the draft. Now, that’s way too early to start reading, so I’ll wait until after my other half has read through her copy and provided her (usually copious) list of notes. I’m in no rush with this book. The Chimney Rabbit is still with several agents, and I don’t really want to have two books doing the rounds at the same time. So I can wait before I carry out my second draft. Then wait again before doing the third. In the end, I hope it will all be worthwhile.